Some of you may remember that in June last year, my birthday actually, I got my first Mulberry handbag. You can read that post here. I will always be madly in love with it. I got the bayswater tote as it can hold shedloads of stuff, and boy do I carry some rubbish around, but it has no sectioning inside, apart from one tiny pocket, and that holds my phone. It's just one big space for all your daily junk to rattle around in and I found myself getting constantly infuriated, hands fishing around inside trying to find, purse, keys, hand cream, whatever it may be. There was no place for anything and nothing had a place. I needed a solution. In comes the handbag organiser. I see so many woman changing their handbags on a regular basis to match their outfits, but for me that would be a total pain in the backside, how they manage to constantly swop bags with all the crap we women carry around is beyond me, transferring every goddamn item, only to find when you reach in the newly colour co-ordinated bag for that nail file/plaster/pills, you've actually left it behind in the previous bag! That's why I stick to one or two hand bags of a neutral colour that will matchy matchy with everything I own. Until now that is. Say hello to this little beauty that's organised my hand bag, so in turn my life. I spotted these on Ebay so ordered one. They vary in price, I picked mine up for £2.99! It's like a nylon-y type of fabric so easy to clean should you ever need too. There are tonnes of colours to choose from, but I chose the coffee shade, as again it will slot nicely into most colour bags. I know you don't particularly see inside but its got to look right! It's got a gazillion pockets and zips so totally holds all my crap, everything has a place and its easy to lay my hands on whatever I'm after, no more thrashing around like a lunatic, having to virtually put my head in my cavernous bag to find something. All is now calm! I am so going to have one of these in my hand luggage bag for holidays too, what a great way to store passports, travel documents, mag, toiletries and all the other shizzle we take on a flight 'just in case'. One thing I will say is that I'm thinking of cutting off its little carry handles as they get right on my nerves when trying to get my purse in and out, and I don't necessarily need the handles there as it's easily lifted out. Come on, organise your handbag, and your life, at that price you can't afford not to. 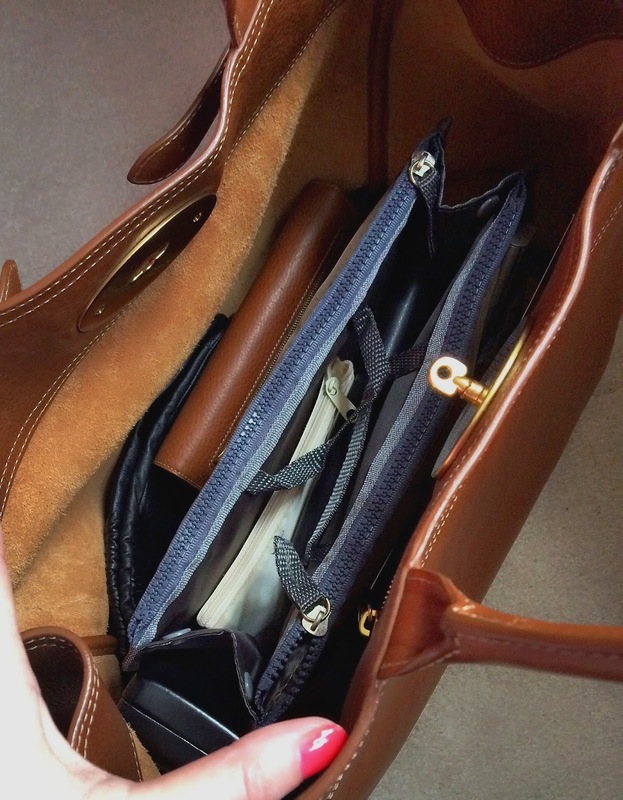 How do you organise your handbags and make the constant changeover of contents from bag to bag run smooth? I 'd really love to know, perhaps I'm missing something? So organised! Great idea, my bags are a mess inside! Mark gets so frustrated when I root around for his car keys lol! Think I'm gonna keep my eyes peeled for one of these!! Love the bag ♡ What a great way to organize and have everything you need on daily basis. I like that it has lots of different compartments. Amazing!